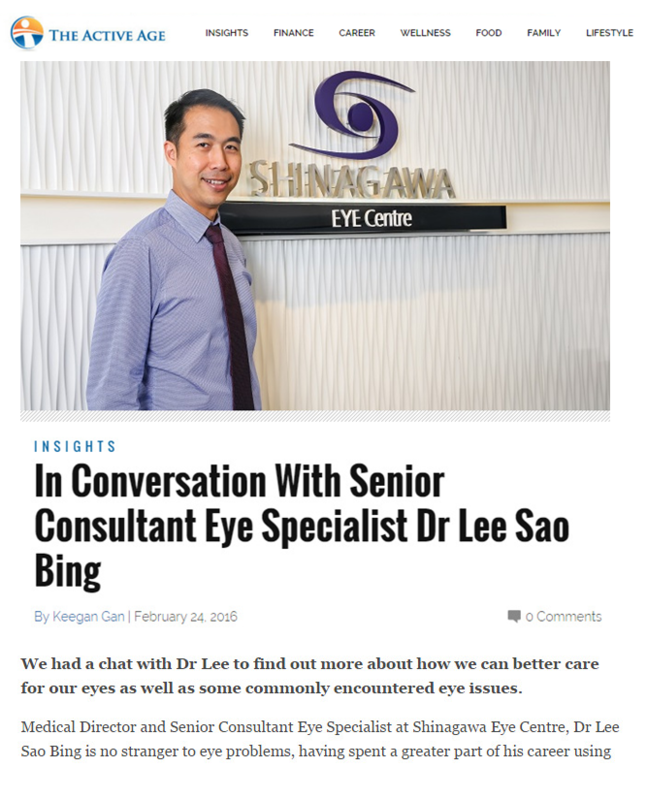 Dr Lee Sao Bing has been interviewed in Active Age regarding floaters, eyelid styes, dry eyes and droopy eyelids. AA: Could you tell us more about those squiggly little things we see at times in our eyes (floaters)? DL: Some of you might periodically see these things as circled in red. The semi-transparent wiggly lines or clumps that float around in our field of view are called floaters. Some of us see one, some see a few of them; some see dots, others see lines or clumps. These things are more obvious against a bright background, such as the blue sky or a white wall, and when you try to look at them directly, they move as your eyes move and seem to dart away. So what are they? Floaters are tiny clumps of gel or debris inside the vitreous humour (a jelly-like fluid) that fills the inside cavity of the eye. Although floaters appear to be in front of the eye, they are actually floating in the vitreous humour inside the eye. Moving our eyes up and down creates currents within the vitreous humour that move the floaters away from your direct line of vision. Floaters occur more commonly in older folks and also in individuals who are short-sighted. Floaters are only a matter of concern if the degenerated vitreous humour pulls away from the retina and tears it. This causes a little bleeding in the eye, and may appear as a group of new floaters. Severe retinal tearing may develop into retina detachment, causing vision loss. A retinal detachment occurs when any part of the retina – the eye’s light-sensitive tissue, is lifted or pulled from its normal position at the back wall of the eye. AA: How beneficial is the colour green to our eyes? DL: The saying that looking at greenery will help your eyes is correct. Note that it is “looking at greenery” not “look at something green in colour”. Look around us and you will notice that greenery is usually a distance away. Seeing far helps to prevent the increase in short-sightedness. It helps relax our eyes. AA: What are some symptoms that might indicate a more serious eye problem, and how can we nip those in the bud before it becomes a big problem? DL: One of the most common eye problems that people tend to neglect care for until it is too late is related to contact lens wear. Many people who wear contact lenses have discomfort from time to time. This discomfort may be in the form of itch or pain or redness or tearing. Many will shrug off this discomfort and continue to wear the lenses. This behavior can lead to an infection of the eye. It is prudent to stop lens wear whenever there is discomfort. Use lubricant eye drops until it is better before using the lenses again. If it is still uncomfortable after a period of rest, it is better to visit the eye doctor. AA: Could you also tell us more about hordeolums and chalazions? Do the occurrences increase as we grow older? DL: A hordeolum or chalazion is a pimple or abscess that forms in the eyelid. It is also commonly known as a stye. It is an infection caused by blockage of the oil gland of the eyelid that in turn develops into a red, painful bump that may last several days to weeks before it bursts and then heals. Some styes are short-lived and heal on their own, while others may require the care of your eye doctor. The frequency of occurrence is not dependent on the age of the person. Some people have more oily eyelid glands and will unfortunately get this more frequently. This is similar to people who suffer from acne frequently due to an oilier face. The condition is treated with an antibiotic ointment that is applied onto the stye. You will also be advised to use a warm towel to compress the area where the stye is. This relieves pressure by allowing the oil that is blocked in gland to be more fluid and at the same time help promote rupture faster. In some people, the eye doctor may advise a small surgical procedure called Incision & Drainage (I&D) to express out the pus. AA: Could you also tell us more about Ptosis and what are our medical options? DL: Ptosis is the medical term for drooping of the upper eyelid. Ptosis is usually caused by a weakness of the muscle that lifts the eyelid, a partial detachment of this muscle, or a nerve problem to the muscle. There are many causes of eyelid ptosis: medical conditions (e.g., stroke); prior eye trauma or eye surgery; congenital birth defect; chronic rubbing of the lids (e.g. allergies); hard contact lens use; on rare instances; and age-related. Sudden onset ptosis can even be an emergency which should prompt an urgent ophthalmic evaluation particularly if there is also new double vision. Most cases of ptosis do not improve with time, but can often be improved with corrective surgery. This surgery involves strengthening the muscle that lifts the upper eyelid. There is one condition that causes ptosis which can be treated with oral medication. This condition is known as myasthenia gravis and affects the nerve junction that supplies the muscle. Oral medication can help improve the ptosis if it is due to this disease.